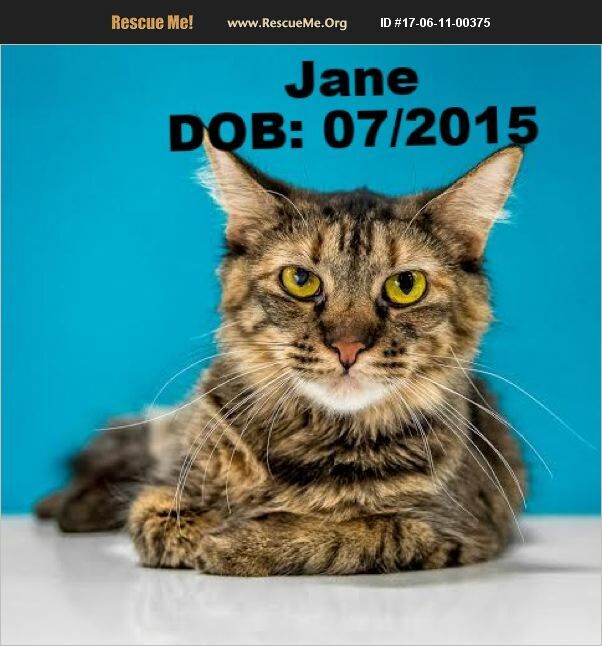 Jane is a 2 year old (07/2015), female, DMH Brown Tabby Cat. Jane is a gorgeous girl with a beautiful soul. She is timid at first but give her time to warm up and she will be your companion for life. She LOVES to be petted and will purr as soon as you go to rub her cute little face. She loves love and has been raised with other cats. She truly is a special girl with a heart of gold. Come meet this sweet girl today! If you are interested in Jane, please complete the Cat Interest Form on our website (www.azrain.org) and, if you are selected as a prospective adopter, we will contact you to set up a meet and greet with Jane. Thank you for considering rescuing an animal in need! The 1st step to adopting any of our cats is to fill out an application by going to our website www.azrain.org. Go to the ADOPT Tab, then Click on CAT INTEREST FORM. Click SUBMIT, OR email it to: info@azrain.org. Some of our Felines are at: 2840 W Chandler Blvd. at PetSmart, in the Lowes shopping center. And also at the Tempe Marketplace location at 1900 E Rio Salado Pkwy Tempe, AZ 85281. FOR ALL CAT QUESTIONS: CALL 480-250-4215 OR 480-285-7322. We have applications available at 2840 W Chandler Blvd. (at PetSmart, in the Lowes shopping center). It is located at the 101 and Chandler Blvd. OR, you can go to our website and get one, then email back to us at info@azrain.org OR, hand deliver it to us on Saturdays at our Donation Table we have set up, right of the front door at PetSmart. Volunteers run the table every Saturday from 10am-2pm. They will make sure it gets to the correct department. Many Thanks! ~~~~~~ We are a 501c3 non-profit Rescue. R.A.I.N. Rescue (Rescuing Animals in Need). ** ALL OF OUR PETS ARE: microchipped, feline Leukemia tested, up to date on shots, and spayed/neutered and dogs are current on Rabies shot. CAT QUESTIONS: CALL 480-285-7322 OR EMAIL: info@azrain.org (for dogs and cats). Cat and Kitten Adoption fees: Pricing ranges from $100.00 on up. Price includes: 1st set of shots/booster, feline Leukemia test, spay/neuter, and microchipping. We try to remove each cat, kitty, dog and puppy as soon as they are adopted. However, everyone that works with R.A.I.N. Rescue are volunteers and have a regular 40 hr. work week. Sometimes it isn't done as quickly as we would like though. Our apologies in advance. CAN YOU HELP US???? R.A.I.N. Rescue is desperately seeking foster homes for SMALL dogs, puppies, cats and kittens. We currently need volunteers for these Departments: Foster Homes, Transporters, Groomer, Adoption Center, Donation Station and Fundraisers. FOSTERING: We take in small dogs, puppies, cats and kittens to foster. The fosters DO NOT pay out of pocket for expenses while fostering ANY animals in our Rescue. The Rescue pays for everything necessary. We also accommodate for time away. *Some of our best fosters have been the winter visitors, who may only be able to take in dogs for 3-4 months. TRANSPORTERS: A person designated to take the dogs and cats for their vetting (spay/neuter etc. ), grooming and sometimes to pick up and drop off at adoption events when the fosters are unable to bring them. Transporters may also pick up new strays/owner surrenders etc. and take them to their foster home. This position will pay mileage. FUNDRAISERS: Anything to help bring in funds to our non-profit Rescue. You will earn 10% of the money brought in to help the animals for each event! GROOMER: A skilled groomer, with their own grooming equipment, who can groom/bathe/clip nails on small dogs/puppies. We will supply the shampoo/towels etc. We will bring them to your location in the East Valley. VOLUNTEERS AT ADOPTION CENTER (located inside PetSmart): Cleaning cat kennels (day and evening hours available), cat laundry (pick up and drop off), play time with cats, feeding cats, walking dogs, cleaning dog kennels, watering, feeding, quiet petting time and play time with dogs. PHOTO POSTINGS: Cats and kittens that are adoption ready at the PetSmart Center. Take photos of cats and kittens and get information on them, post on three of our favorite sites online. DONATION STATION: Someone to faithfully be at PetSmart and set up the donation table (table provided). The table will have items on it with information about our rescue, our business cards, volunteer job listings, a donation jar, and a donation basket for anyone wanting to donate misc. items (dog food/toys etc.) and small items that can be given out to those who donate. Flexible day(s) and time(s) can be discussed. All these positions help the animals find forever homes. Please open your heart and possibly your home, costing you only time. Nothing out of pocket��%BD'��%BD|.and all from your heart. Many Thanks!!!! If you are able to help out-Please go to our website for a volunteer or foster application www.azrain.org.